Established in 1980 to encourage inter-disciplinary collaboration among visiting artists, Inter-Arts sponsored an ongoing series of forums, lectures, readings, performances, film and video screenings, and short-term workshops. Major productions include "Princess of the Stars" by R. Murray Schafer (1985), "Viewpoints on Arts and Technology" (1986), the experimental radio broadcast project "Radia 89.9" (1989), and "La Trahison Orale" by Maurico Kagel (1990). 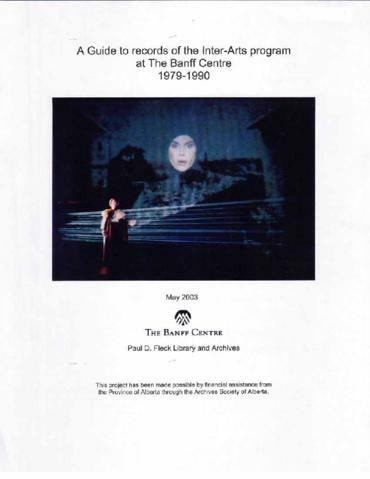 Artistic Directors include Michael Bawtree (1980-1982), Michael Century (1982-1988), and Claude Schryer (1988-1990). Includes 5.6 m of textual records, ca. 900 photographs, ca. 380 audio cassettes, 86 videocassettes, 3 7" audio reels, 2 10" audio reels, 5 prints, 1 16mm film reel, and 1 technical drawing.